My high school boyfriend and I used to celebrate our "anniversary" every month with the same romantic gesture. I would bake him a batch of chocolate chip cookies and he would get me a rose for every month that we had been dating. We'd walk through the halls hand in hand, parading around our tokens of affection for each other like two young puppies in love. Our relationship lasted for a year and three months, which in high school time is more like 3 years. For our one year anniversary I planned a romantic dinner for two at my house, and what better dish to prepare than homemade lasagna. In my family, lasagna was made only for very special occasions, and rightfully so. Lasagna is truly a labor of love. I had seen my grandmother make lasagna several times, an all day process that was not to be taken lightly. The par boiled noodles would be set out to dry in between red and white striped kitchen towels lining the kitchen table, and the smell of bolognese sauce cooking on her avocado green stove would perfume the house, reassuring us that this meal would be worth the wait. I asked my mom for the recipe, but like most of the recipes in our family, there wasn't one written down. This was a dish learned through watching, a recipe that changed slightly with every generation it was passed down to. 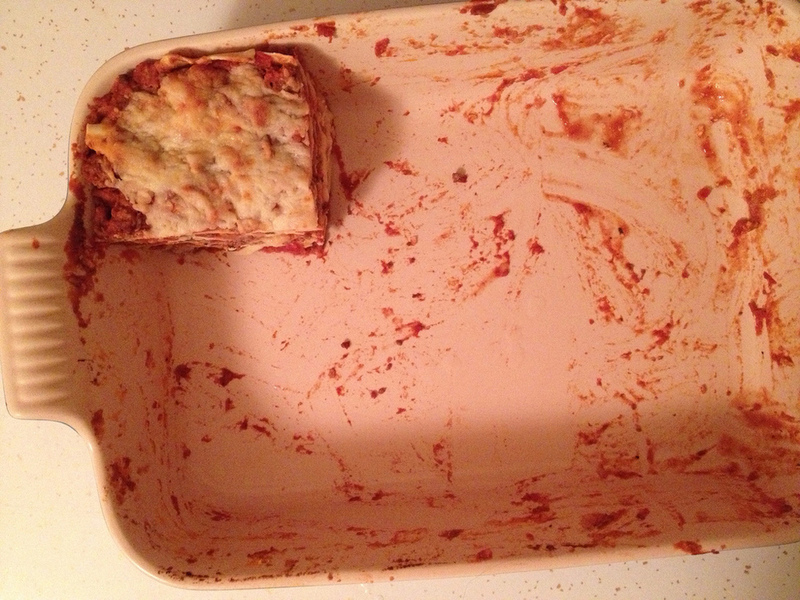 My mom did happen to leave me with a few words of advice: water is lasagna's worst enemy. Like a good kid, I did as I was told. I drained the ricotta overnight and let the par-boiled noodles sit out to dry between kitchen towels just as I had seen my grandmother do so many times before. I relied on my strong Italian genes to instinctively make a bolognese sauce, letting it cook all day long until it was thick and meaty. 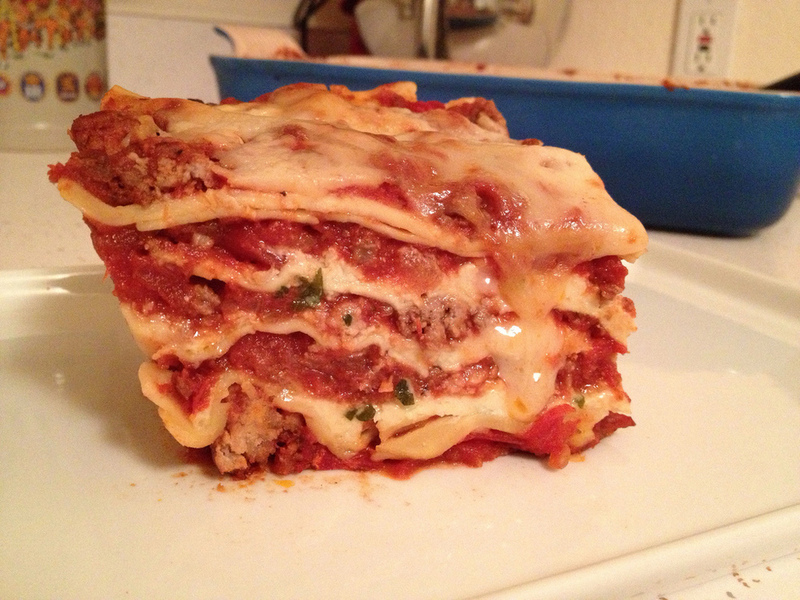 Each layer of lasagna was carefully crafted until the large glass dish was full to the brim. Sauce, noodles, ricotta, mozzarella, repeat. That was my first and last lasagna in nearly 15 years. I didn't avoid this recipe for all these years because I made it for the first guy to break my heart, or the fact that it takes more than a day to make. And to be perfectly honest, I can't give you a straight answer as to why. But this time of year, with Valentine's Day having come and gone so quickly, got me thinking about why we cook. Sure, eating is a necessity of life, but we choose to cook things that are labor intensive or make something from scratch that could just as easily be bought at the store. Even the simplest of meals says a lot about who we are as humans. I take great comfort in sitting around the kitchen table laughing and sharing stories, or even in silence, just knowing that the meal in front of me is a such a thoughtful gift. Cooking a meal for someone else is the most sincere gesture of love. So let us all make lasagna and show our special someone just how much we care. And even if you only make it once, or every 15 years, I promise you it will be worth the effort. 4 large sheets fresh pasta dough, approximately 18 x 18"
*I put my own spin on this lasagna by adding pancetta to the bolognese sauce, and then played up its smokiness by adding smoked mozzarella to my cheese blend. I also used fresh pasta to avoid the hassle of pre-boiling the noodles and drying it out for hours. I did have to give the pasta a quick rinse to remove the excess flour, and pat them dry a bit, but using fresh pasta noodles was a huge time saver. Drain ricotta in a large mesh strainer over a bowl. Cover strainer with plastic wrap and leave in refrigerator over night to drain until you are ready to assemble the lasagna. At least 4 hours before you want to serve the lasagna, start the bolognese sauce. In a large 6-7 quart soup pot , preferably enameled cast iron, heat up 1 tablespoon of olive oil over medium high heat and add Italian sausage. Brown the sausage, approximately 3-5 minutes per side. Remove from pan and set aside. In the same pot cook pancetta for 6-8 minutes until it has browned and the fat has rendered a bit and crisped up. Remove from pan and set aside. In the same pot add the ground pork, breaking it up into small chunks with a wooden spoon. Cook for about 5 minutes, or until the meat has cooked on the outside. Don't worry if it's not cooked all the way through. It will finish cooking in the sauce. Remove from pan and set aside. Repeat this step, cooking the ground beef this time, until it is almost completely cooked through. Drain all fat from pot and wipe clean. Prepare bouquet garni of fresh herbs and bay leaves in a cheesecloth satchel. If you don't have cheesecloth, tie the herbs together with cooking twine for easy removal later. Over medium heat, heat 2 tablespoons of olive oil and sweat the minced onions and garlic in the soup pot until translucent, about 5 minutes. Next add Italian seasoning, chili flakes, garlic powder, salt, and tomato paste. Cook for 5 minutes, stirring constantly until the tomato paste has thickened slightly and darkened in color. Deglaze the pan with red wine and balsamic vinegar. Continue stirring to scrape up any brown bits that may have formed on the bottom of the pan. Add crushed tomatoes and stir to combine the tomato paste mixture. Then, return all of the meat to the pot. Give everything a good stir and throw in the bouquet garni, burying it in the sauce. Bring sauce up to a boil, cover and then reduce heat to low. Let the sauce simmer for at least 2 hours. 3 would be better. Make sure to stir and taste occasionally to check if the sauce needs any additional seasoning. Somehow the bolognese gods were with me the day I made this and I didn't have to add anything else to the sauce. I just let it cook for hours and the flavors developed wonderfully on their own. At the end of 3 hours, your sauce should be very thick. Remember WATER IS THE ENEMY!! While your sauce is simmering grate all of the cheeses in a large bowl. Mix so that everything is well combined. Next, prepare the ricotta. Discard the liquid in the bowl and wipe it dry. In the same bowl combine ricotta, egg, and basil, and divide into thirds. Next, you'll want to give your fresh pasta noodles a bath to remove any excess flour. Carefully run the sheets under warm water in the sink. Some of the noodles may want to tear, but that's OK, you'll have to cut the sheets to fit in the lasagna pan anyway. Lay the noodles flat onto kitchen towels to absorb the excess water. Once your sauce is ready, it's FINALLY time to assemble the lasagna. 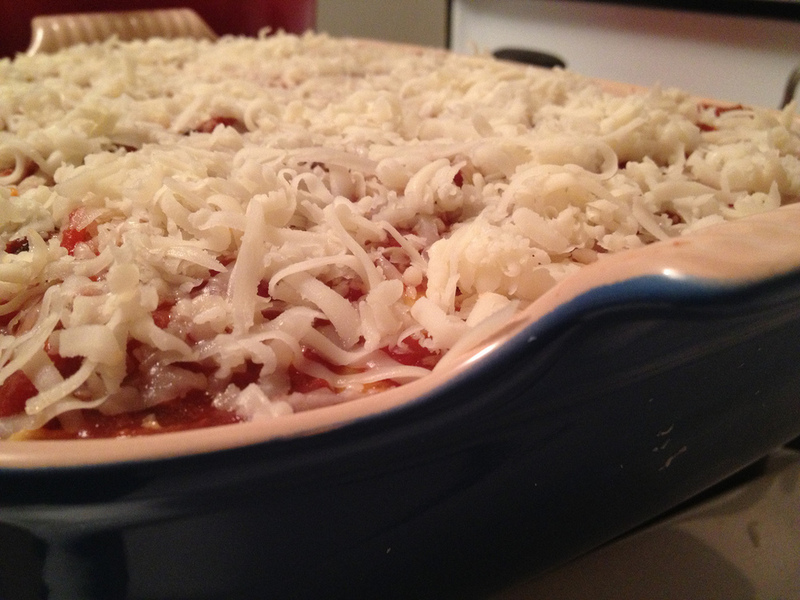 In a deep 9 x 13" baking dish, spread a thin layer of sauce on the bottom. Next, put a single layer of pasta noodles over the sauce. Fresh lasagna noodles are fairly thin, so if you like your lasagna to have more of a noodle presence, double up your noodle layer. If you decide to do this, be sure to double the amount of pasta called for in the recipe. Next spread 1/3 of the ricotta mixture on the noodles so that most of the pasta is covered. Sprinkle approximately 1 3/4 cups of the cheese mixture on top of the ricotta. 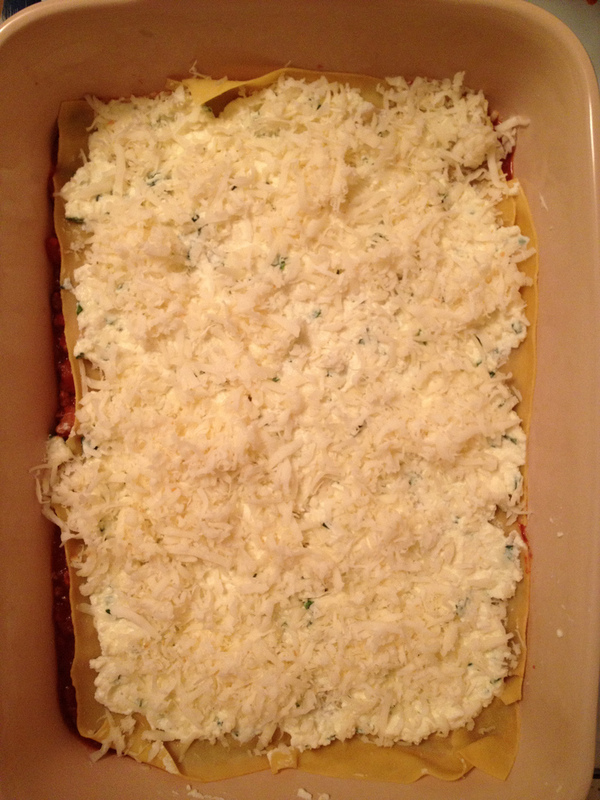 Cover the cheese layer with more sauce and then repeat the whole process until you have 3 layers of ricotta. The last layer should just be sauce and grated cheese. Bake for 25-30 minutes until the cheese is melted on top and has browned slightly. Let the lasagna rest for at least 10-15 minutes before cutting into it. Serve with a side of Italian sausage, and if you're feeling really gluttonous, some garlic bread.